Accurately depicts exact location, color and psychodynamics of each chakra ~ A powerful tool for transformation! An eco-friendly product, made in the USA by the original artist! 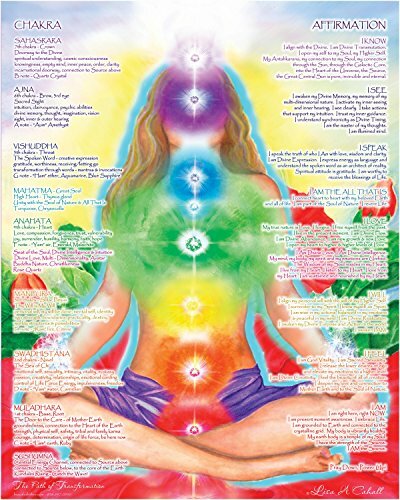 This poster is beautiful, educational and an energy healing meditation tool! The colors and placement of the chakras are exact. Simply gaze at the central core of the print and allow the image to enter into your energy field. It is designed to align and heal your chakras through resonance. The sanskrit name, note, seed sound, associated gemstone and description of each chakra is on the left side of the poster. Statements of affirmation are on the right. The affirmations express the highest attributes and functions of each chakra. When spoken aloud they assist in strengthening, balancing and harmonizing the chakras and energy field. This poster is printed in vivid colors using vegetable inks on high quality poster stock composed of up to 55% post-consumer recycled materials. This is an Eco-Friendly Product and is shipped in a sturdy poster tube. Namaste!